Southwest Airlines (SWA) in the United States is the world’s largest domestic airline. Incredibly it has been profitable for 43 consecutive years in what has been called the world’s largest non-profit sector – the airline industry. The story started in 1971 with 200 employees and 12 flights per day. Today it employs 46 000 people and runs an incredible 3600 flights daily. It’s a massive company, which above all is famed for its legendary customer service. Few other organisations over that period of time have made their unique brand of culture stick longer than them. People the world over want to know how they do it. How do you build an incredible culture of customer service? How do you sustain excellence through the good and the bad times and become one of the worlds most admired and written about corporations? These questions are on the minds of many CEO’s in South Africa today. I got a unique personal insight into Southwest Airlines last month. I was in America participating in an event with The Table Group, Patrick Lencioni’s company – which has the distinction of being the only leadership consulting business invited to work inside the airline. It was here that I met Dave Ridley. He has been an executive with SWA for 27 years and has worked everywhere in the business, most recently as the Chief Marketing Officer. He retired from operational roles earlier this year, but still retains an office at Southwest and serves in the enviable role as senior advisor to the CEO. The undisputed highlight of his long and successful career was working with two fabulous leaders, the company founder, Herb Kelleher and present CEO Gary Kelly. It was Kelleher who coined the now well-known phrase that ‘the business of business is people’ and that people are ‘motivated more by love than by fear’. Intentionally and with much hard work they have in essence built the company around these two simple ideas. I asked Dave to tell me more. It’s a spectacular company but not a perfect one he told me with humility. It’s a place where people work very hard, but where there’s lots of laughter and fun. “The inside looks like the outside,” he added, meaning there is minimal politics and what you see is not fake PR designed to make them look good. It’s genuine and it’s real. At their core is a value system. Just three values that they live out and protect passionately. The language is very appealing. It is fresh, surprising and incredibly simple. Not infected by corporate jargon that is the death of so much corporate communication. I asked him how you make your culture stick, a question many executives ask me. All success is about leadership. Culture depends on it. Hire the right people, establish the values, and ensure all the smart things are in place – the strategy, technology and processes, but most importantly have the right kind of leaders. Ultimately it depends on the people and the people ultimately depend on the leadership. As Dave explained culture is really about organisations that are trying to make a difference with their customer service delivery. This is where they start. They want great service and they want people to be happy. To stick, the inside has to look like the outside. It has to be genuine for people to really commit. My meeting with Dave reminded me that your culture is the heart of your business and without one it is just a machine. People need a heart to give of their best. And when they do you have something that is very precious – a unique and genuine source of competitive advantage. Does your organisation have a heart? We love hearing from you. Comment below and we will send you Patrick Lencioni’s The Three Signs of a Miserable Job Model – a great place to start thinking about how to improve your corporate culture. Definitely the most important thing to get right in an organisation………and the very hardest thing! It takes every single leader to sing off the same hymn sheet. And the smallest failures in truly ‘living the culture’ by leaders have a big ripple effect. But they (SW Airlines) certainly seem to have gotten it right! Great article Grant – love the values… they connect, are clean and are easy to live in good times and tough moments. Going to have to book a flight with them now! What a really great article…and so true! This the most important requirement for the survival and efficiency of any organization. Irrespective what a business sells, it’s about PEOPLE! The human element is the only business component that is truly alive. Thank you for this heart-warming article. What a totally unexpected culture from an American corporate – defies the stereotype of big business bottom line focus. Create the correct values by acting and behaving with honor, respect and heart. It will flow through ……. not impressed if the heart is not realy concerned . Except I firmly believe that culture is a critical component OF strategy. I flew on Southwest from LA to Las Vegas a year ago (‘Lost Wages’, as the cabin crew announcer put it): what a great experience! The simple values really resonate, heart and leadership! CULTURE!!! Great word, but it is all about relationships with the human beings that ARE the company!! I am sure there are not many vacancies at SWA – why would people leave. Leadership = See people as people, Work to earn respect, Thrilled when the team achieves, Empower with honesty and transparency, Takes the punch for the team, Connects daily tasks with business goals (long term), Results orientated not process driven!!! 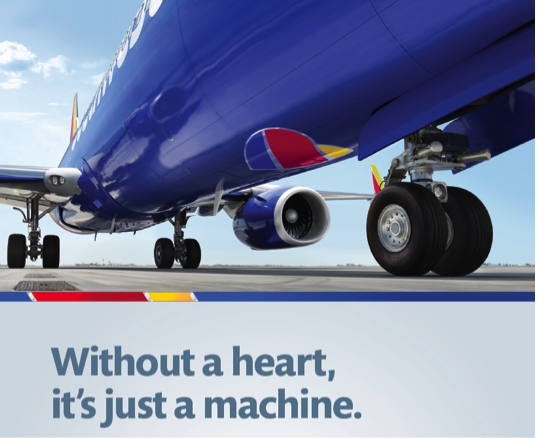 SWA is not a great company per say – great Leadership, over an extended period, established a workforce that “lives” SWA! That’s why they can promote the motto: ‘the business of business is people’ and that people are ‘motivated more by love than by fear’. This is brilliant and an example to all companies. I agree with this statement completely: “All success is about leadership. Culture depends on it. Hire the right people, establish the values, and ensure all the smart things are in place – the strategy, technology and processes, but most importantly have the right kind of leaders” and all the staff members will follow and everyone be happy. A happy person is much more creative and productive than a sad person.